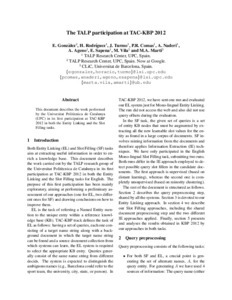 This document describes the work performed by the Universitat Politècnica de Catalunya (UPC) in its first participation at TAC-KBP 2012 in both the Entity Linking and the Slot Filling tasks. González, E. [et al.]. The TALP participation at TAC-KBP 2012. A: Text Analysis Conference. "Proceedings of the Fifth Text Analysis Conference (TAC 2012)". Gaithersburg, Maryland: 2012.